Lionel Messi, who is currently recovering a knee injury, are privy to the finest brands of equipment and receive treatment from the world's best doctors in order to minimise their spell on the sidelines. And Barcelona superstar Messi is doing just that in order to reduce his expected eight-week injury layoff. The 28-year-old revealed on Facebook that he was using a device called 'Game Ready' to help him 'come back stronger' from his latest injury setback. 'Game Ready' speeds up the process of recovering from muscle, tendon and ligament injuries as the device circulates water around the injured body part. The device, which can be rented out in the UK for £300 a month, has military grade specification. 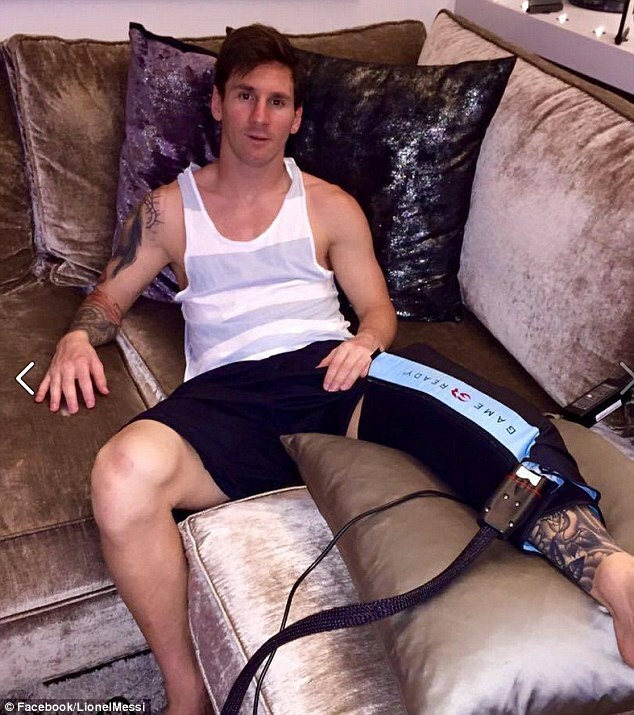 Messi uploaded an image of the wrap acting as a form of compression on his left knee, while sat looking in a relaxed mood on a sofa. The 'Game Ready' wraps have been relied on by countless athletes and teams from virtually every professional sport across all division, according to the product's official website. Messi faces a race against time to be fit in time for Barcelona's match against La Liga rivals Real Madrid at the Santiago Bernabeu on November 22. Luis Enrique's side fell to a narrow 2-1 defeat by Sevilla on Saturday as they failed to cope without their star man. Messi had scored six goals in 10 appearances before sustaining a knee injury against Las Palmas at the end of September. His Facebook post came on the same day it was revealed he was to stand trial on three counts of tax fraud along with his dad, Jorge. The pair were accused in 2013 of defrauding the taxman out of 4.16 million euros (£2.72 million) in taxes related to Messi's image rights between 2007 and 2009 through the creation of fake companies in Belize and Uruguay.